« You mean I DIDN’T invent the term “monkey-fish”? Staff at the Johnson Space Center, in cooperation with the Arizona State University School of Earth and Space Exploration, have scanned in hundreds of photos from the Mercury and Gemini mission in the 1960s. The images are available online at the March To The Moon Image Gallery. The images were generally taken with stock and specially-modified Hasselblad cameras. It looks as if they plan to post Apollo images as well. This particular image comes from the Gemini XII mission, which took place in November of 1966. Jim Lovell (later of Apollo 8 and 13 fame) and Buzz Aldrin (Apollo 11) practiced rendezvous with an Agena target vehicle. They were supposed to use the Agena’s engine to boost the mated vehicles to a higher orbit, but the Agena developed a problem and that part of the mission couldn’t be completed. 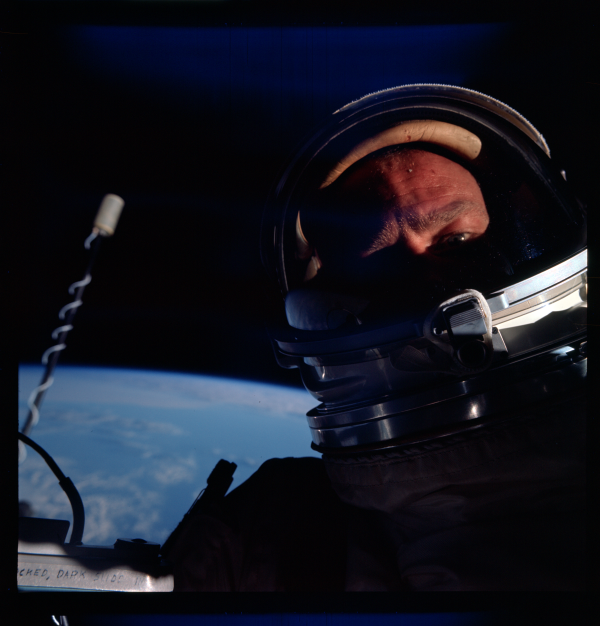 Aldrin did three spacewalks, and the re-entry of the capsule was accomplished using an automated system. Anyway, the imagery is gorgeous, especially for being taken under the conditions of the beginnings of manned space flight. I look forward to the addition of the Apollo images!